Charity Golf Tournament, Four Man Scramble, Friday, Dec. 5th with Tee Time @ 10 a.m. @ the Alamo City Golf Course, 9700 Rochelle St.
Benevolence Works wants to raise awareness of the homeless veterans in San Antonio. Donation: $100 per player (includes lunch, green fee, car fee, range bucket, & 3 drink tickets. Contact: Kris Garcia @ Alamo City Golf @ 210-696-4000. Limit to the first 100 players. For more information: Contact Linda Hartman or Zeon Willson @ 210-223-1229. Friends and supporters of Tree of Life Christian Children's Center and Orphanage, Buriram Thailand in San Antonio Texas and worldwide: I am a San Antonio native who has spent the last 20 years abroad serving in ministry, first in the Middle East (til Jan 1998) and for the past 11 years in rural Northeastern Thailand. I was an active Gideon in San Antonio for quite a few years before accepting assignment overseas. I have been closely involved with that ministry for the past 33 years. 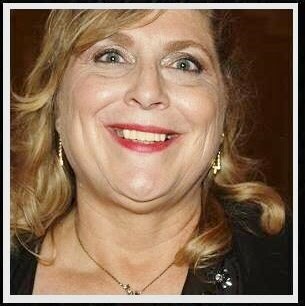 I was a school administrator in the Southside School District and was responsible for the social services and support activities for the poor children in that district there supervising assistance to the children of Villa Coronado and also taught part time at San Antonio College in the History Department. I will be back in San Antonio in April 2009 to help raise funds for the work here with indigent children in the lower isaan region of Thailand. Since the economic difficulties emerged in the USA over the past two months we have experienced a serious drop off in donations to keep the orphanage efforts going strong. We are struggling with paying school costs, utility buildings, fuel bills, and food purchases like everyone else. Unfortunately we don't have reserves to fall back on in lean times other than prayer. Christmas time is coming even here in Thailand and we hope to see Christmas here at TOLO for the children who live with us and those we support in the community. 140 kids altogether when we include the 121 kids of Ban Yoei Sakae School who we have been helping for the past four years. If you could consider sending some childrens gifts we would be grateful and the kids could see the love of Christ poured out for them, the least of His brethren. Consider doing what you can to make this a blessed Christmas season. If you would rather send funds in lieu of gifts to make some purchases to save the cost of shipping overseas which is quite expensive, send a check made payable to Family Life Church, 1400 East Loop 301, Sulphur Springs Texas 75482 USA and indicate on the check for the Walker's in Thailand. Pastor Terry Sparks and Crystal will see the funds are sent to us here in Thailand. JAFF ( Joy After Fifty-Five) will host a December 13th ,Christmas Party in the Fellowship Hall from noon -3 p.m. Shirley Long is coordinating plans for the party and if you are willing to help out, please contact Shirley. The meat (turkey and ham) for the meal will be provided, everyone is asked to bring side dishes and a dessert. Ladies are asked to decorate a hat for Christmas, the Lady with the best decorated hat will win a prize. Everyone please bring a gift. Northwest Church of Christ is located @ 9681 W. Loop 1604N. near Braun Road. After being opened since November 11th, 2001, the WWII Memorial Museum of San Antonio regrettably closes its doors November 29th, 2008. Funds are not available to sustain the museum. Started with Steven Stoli’s personal collection as well as donations from hundred’s of San Antonians, the museum has been a labor of love for those involved. The news about the WWII Memorial Museum’s financial peril surfaced on Veteran’s Day, driving more than 450 people to visit it and donate almost $500. Curators from other San Antonio military museums also gave support and suggested a consortium of military museums be formed with the goal of a San Antonio Military Museum downtown. Unfortunately, no “good Samaritan” provided enough money to keep the museum going until the end of the year. Stoli will be shutting down the museum until a new home can be found for the collection. People who donated artifacts can either pick up their items or leave them in the collection. If the item is taken from the collection, there is no guarantee that it will be accepted for display in a new facility. Items remaining in the collection will be carefully put away and stored in a controlled environment until a new space is found. For more information about the collection, call 408-0116 extension 6. The World War II Memorial Museum of San Antonio is located at 11840 Wurzbach at Lockhill Selma in the Elms Center. Please join us at the second session of the “Smart Women” Brown Bag Series on Wednesday, December 3rd at the Children’s Shelter. The topic for the session is “Smart Women and their Children are Leaders in the Volunteer World”. 2008 has been a momentous year in the history of the San Antonio Museum of Art, full of exciting achievements, interesting exhibitions, stimulating activities and fantastic educational programming. It is time to reflect on a year of successes and milestones, yet it is also a time to look forward with anticipation. In a few short months, the waters of the San Antonio River will flow past the San Antonio Museum of Art, ushering in a new and exciting era for the Museum. With your help, we can continue to enhance SAMA's programs, exhibitions and services to the community in what will surely be a landmark year for SAMA. Please consider making a year-end gift to the SAMA Annual Fund. Your contribution will directly support the Museum's general operations and help maintain SAMA's ongoing schedule of programs and exhibitions. 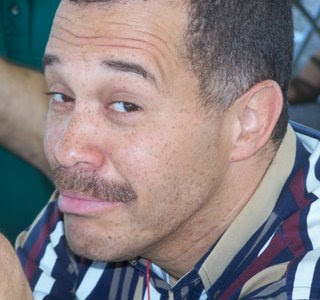 Click here to donate to SAMA online. Annual Fund gifts may also be mailed to the SAMA Development Office, 200 W Jones Ave, San Antonio, Texas 78215. Or, you may call 210.978.8133 to pay by credit card over the phone. Thank you for being a part of our SAMA community. We are most grateful for your contribution to our successes - past, present and those still to come. 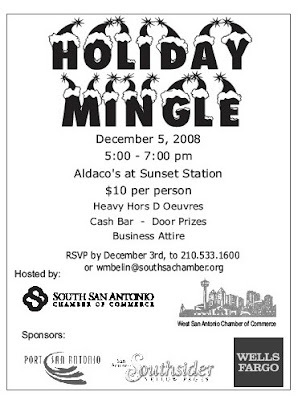 Holiday Mingle , Dec. 5th @ Aldaco's @ Sunset Station from 5-7 p.m. $10 per person. RSVP by Dec. 3rd. Call" 210-533-1600. Grandma's Bragging Rights says, "Thanks for the Memories"
Thank you so much for the many calls, well wishes, and cheers for the Byron Steele Knights and my grandson, Jake "Ocho" Trevino, the quarterback of the Knights. Unfortunately we were not successful in our quest for the State Championship and were eliminated in the second game of the play offs in a heartbreaking game where they lead by 14 points at half time. It was not to be and we were defeated by Lake Travis. 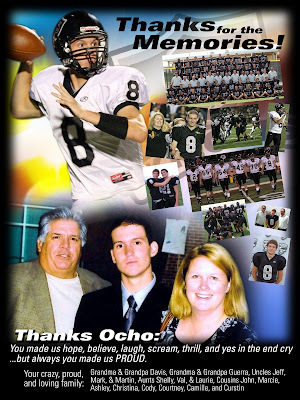 Jake "Ocho" Trevino is a senior in a graduating class of 854 seniors. He has placed # 34 in that class. A straight A student and member of the national honor society. He is an accomplished BMX bike racer having placed #2 in the world in world trials in Argentina and Canada. He has competed in BMX across the nation and now the world since he was four years old. Jake aspires to enter a Texas University next fall after he graduates and plans to study Chemical Engineering. His dad, Joe Trevino, (my youngest son) has served as the President of the Byron Steele Booster Club since the school opened four years ago. 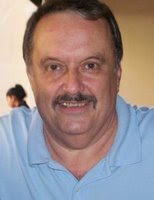 Joe is the Regional Manager of Certified Folder Displays covering San Antonio, Austin, Corpus Christi the Rio Grande Valley. Joe was a founder with me of GTO Adverting when I started 26 years ago. To say I am proud of him and his precious wife Julie is an under statement for sure. Thanks you Walker Report for being a true family values blog and letting this grandma exercise her God given "bragging rights". It was an exciting year for us, Thanks for letting us share this poster with Walker Report viewers and friends. Our family presented it to Jake after our Thanksgiving dinner. It reads: Thanks Ocho:You made us hope, believe, laugh, scream, thrill and yes in the end cry...but always you made us Proud. Your crazy, proud and loving family, Grandma and Grandpa Davis, Grandma Alice Guerra & Grandpa Andrew Guerra, Uncles Jeff, Mark and Martin, Aunts Shelly, Val & Laurie, Cousins John, Marcie, Ashley, Christina, Cody, Courtney, Camille, and Curstin. I hope you had an excellent Thanksgiving. I wanted to invite you to the second Torchlight Presents! mixer on December 11th. It will be located at the Java Connexion coffee shop at 6565 Babcock Rd, Ste 9. It will take place from 6-8 p.m. and this time we'll be presenting Medina Children's Home. 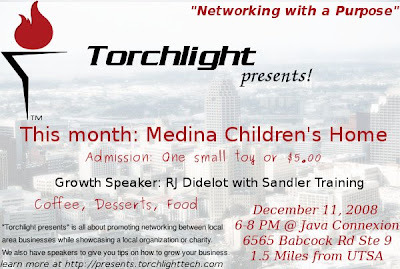 RJ Didelot from Sandler Training will be our growth speaker. The admission for this event is either $5 donation to the Medina Children's Home or a small unwrapped toy. We want to make sure all the kids at the Medina Children's Home have a Merry Christmas. Of course as always, you get the opporunity to network and grow your business. Let me know if you can make it. Tickets are available from singers ($12-$15), by credit card at www.sachoralsociety.org, by mail by phoning (210) 228-4147. (leave a message). Tickets available at the door at IUW and OLLU. Donations are accepted in lieu of a ticket at First UMC of Boerne and Mt. Zion 1st Baptist Church. Come celebrate the season with us! We hope to see you there. Local attorney Carlos Solis opened his new law office on N. North New Braunfels, Friday, November 28th with an official blessing by Catholic Priest Tony Vilano. 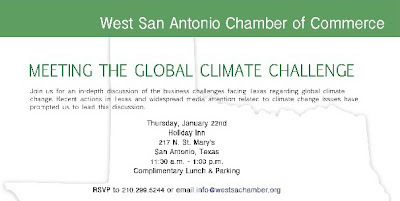 Meet the Global Climate Challenge @ a luncheon, Thursday, Jan. 22nd @ the Holiday Inn, 217 N. St. Mary's from 11:30 a.m.-1 p.m. RSVP: 210-299-5244. 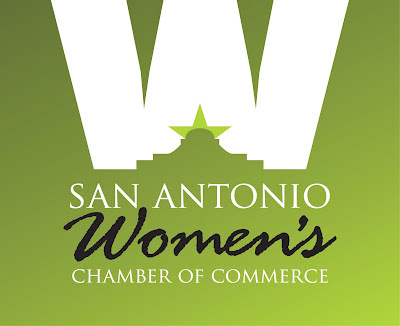 The Chamber invites your company or organization to set up a display table at our event. Display Tables: $50 for Members; $75 for Non-members. This week we have two special video emails for you. Not willing to walk through our problems can lead one to believe that life would be better if something would be different. However, it is far better to believe that God can change the situation than to doubt him during the problems. Make it a priority to stand firm in God so that you will not faint under the pressures of life. Spend time into reading and memorizing God's word, praying, and communing with God. Watch this week’s program. Click on link below! Become our Face Book friend! One more milestone was accomplished today @ the Walker Report as we topped the 4,700th post in our two and a half year history. Sounds good huh? We encourage our viewers to share our link with their friends so our numbers will rise. Lately our daily numbers seem to reflect the stock market as we are for the first time in our existence starting to decline slightly in viewership. Not good. We encourage more readership not less. Remember, we cover events that media ignores. But enough whining. On to 4,800 posts and 400-thousand views! Benevolence Works wants to raise awareness of the homeless veterans in San Antonio. Donation: $100 per player (includes lunch, green fee, car fee, range bucket, & 3 drink tickets. Elected Officials, VIPs, JROTC Cadets & others volunteered to serve the hungry on Thanksgiving @ the Henry B. Gonzalez Convention Center for the 29th Annual Raul Jimenez Thanksgiving Dinner. 23rd Annual Light the Way, Nov. 22nd @ 7:30 p.m.